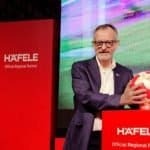 Hafele announced an exciting new collaboration as “Official Regional Partner” with FC Bayern, the world-famous football club. 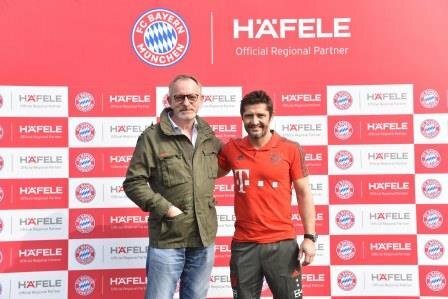 German hardware and Fittings Company Hafele announced its new collaboration as “Official Regional Partner” with FC Bayern, the world-famous football club and are proud to welcome FC Bayern’s international football legend Bixente Lizarazu to guide and share his experience with the future budding woman football stars from Manipur. The football legend Lizarazu shared his experience in an interactive session with the team by a master class which covered a display of on ground demonstrated today on 2nd February 2019 at the Adidas Football base – Plaza, Chattarpur – Delhi. The initiative was taken by Hafele to provide international exposure to the enthusiastic players from the remote areas to promote India’s talent at international level. India has been an addition to world’s football picture with its commitment, enthusiasm and pure dedication towards the game. Football is certainly on the rise especially among kids and teenagers, which is crucial for the further development It has been an honor for me to share my knowledge and learning to these young talents. It has been absolutely to witness such amazing skill set, says Bixente Lizarazu. Both Hafele and FC Bayern have deep roots in Southern Germany (Bavaria) with over nine decades each of tradition, expertise and precision creating a leadership position. Both are growing from strength to strength: FC Bayern with innovative game strategies and Hafele, whose renowned expertise in Interior Functionalities is powering the company to succeed in India, Bangladesh and Sri-Lanka: the three regional markets concerned. Being an official regional partner for FC Bayern, Hafele wants to support football lovers & all those players who are not getting enough opportunity for their due diligence. The association between Hafele and FC Bayern is an excellent venture between two strong brands and their shared love for world class football and respect for decades long heritage, performance, international strength and teamwork, says Mr. Jürgen Wolf, Managing Director, Hafele India Pvt Ltd.
Hafele brings FCB legends to delight football fans!